My father-in-law is a general contractor. Over the years he has been paid to complete different tasks – from building an entire house to hanging a picture in someone’s home. During two summers while I was in college he hired me to work for him and I quickly realized two things: 1. I’m not that handy, and 2. Having the correct tool for the job is the difference between being a good general contractor or a great general contractor. I’ve carried that knowledge with me, and think of it often, when I download, experiment, and simply play with new and different online tools. I get asked all the time what tools I use and recommend to help me get things done and the list below represents the tools that I am currently using to help me in my professional and personal life. A few of the tools on this list are new and a few I have been using for years. I encourage you to check them and experiment to find the correct tool for your job. 1. Leadpages – I use Leadpages for landing pages and can’t recommend them enough. The user interface is very clean and intuitive and allows you to create beautiful landing page in minutes. Not only can you create landing pages but they also allow you to create Leadboxes and Leadlinks – two very slick tools. Leadpages is not free but I think they offer a ton of value for the fee. If you are doing ANY kind of advertising online, e.g. Facebook Ads or Google Ads, and you’re not using landing pages you need to check out Leadpages today! 2. Hootsuite – I use Hootsuite to manage my Twitter, LinkedIn, Facebook page, and Facebook group. Hootsuite offers to many features to mention but I’ve explained 8 reasons why I love Hootsuite. 3. Hubspot – I have been using Hubspot at Sewickley Academy for four years now and I can’t recommend them enough. We do so many things using the Hubspot suite of tools including: blogging, landing pages, keyword research, email marketing, call-to-action (CTA) creation, lead nurturing, and analytics to name a few. 4. Rainmaker – I have big plans for SchneiderB.com in 2015. In order to accomplish those plans I realized that I needed additional tools to turn my goals into a reality. Enter the Rainmaker Platform. You’ll probably notice the change in design at SchneiderB.com which occurred when I transitioned to the Rainmaker Platform from Copyblogger. There are SO many reasons why I changed and I’ll let you read about all the features of this new platform on their website. 5. Todoist – I’ve been a disciple of the the Getting Things Done system by David Allen for years now. I can’t believe how much the system has helped me accomplish my goals since I’ve implemented it. While I used Nozbe in the past to help me implement GTD online I’ve recently switched to Todoist and haven’t looked back. 6. Trello – This online tool bills itself as “free, flexible, and visual way to organize anything with anyone.” When I initially signed up for free I wasn’t sure that I understood how to use Trello. Since that time I’ve come to appreciate and value Trello to help me manage projects for myself and with my team. 7. Mindmeister – As much as I try be paperless in my personal and professional life they one thing I miss using paper for is brainstorming. I like to use Mindmeister to brainstorm and organize my thoughts. 8. Evernote – OK. I’ve said it time and time again but Evernote is the center of my digital life. Heck – Evernote might even be the center of my life. If you haven’t been able to get started with Evernote you might want to check out my 6 tips for getting started with Evernote. 9. IFTTT – In an effort to become more efficient I started using If This, Then That (IFTTT) which allows me to create short “programs” which complete repetitive tasks for me automatically. 10. Schedugr.am – We’ve seen a huge increase in Instagram usage within our Middle School and High School at Sewickley Academy. While we are trying to do some interesting things with Instagram one of the biggest difficulties using this social media channel is that you can not schedule posts to Instagram. Now you can with Schedugr.am. Schedugr.am allows us to schedule Instagram posts anytime day or time. 11. Tailwind App – While Sewickley Academy has been on Pinterest for a few years now we’ve decided to spend more time nurturing and developing our presence on Pinterest. In order to take our Pinterest account to the next level we started using Tailwind App to help us with our Pinterest Analytics and it also allows us the ability to schedule pins on Pinterest. 12. [email protected] – I really enjoying listening to music while I work but I discovered a few years ago that I prefer to listen to music that doesn’t have words. I found that if music has words I tend to focus upon the words which ends up being a distraction for me. I found [email protected] because it has a wonderful selection of ‘background’ music at a great price. The fact that [email protected] claims to boost my concentration and focus is simply a bonus. 14. QuotesCover.com– As I just mentioned visuals are incredibly important and one of the most popular visuals on social media are quotes. This free tool allows you to create images with quotes in a number of different image sizes. 15. Olark – Have you seen the chat window that pops up with my face on the admission pages on Sewickley Academy’s website? I use Olark to get that chat window and am able to chat with families when they are literally looking at our school online and answer their questions in real-time. 16 Friends+Me – This tool allows you to focus on Google+. It achieves this by reposting any Google+ post to your other social media channels of choice. It has a bunch of customization options and has helped me to be more efficient and effective on social media. 17. Dropbox – If Evernote is the center of my digital life than Dropbox is my digital soul. I use it store everything and love that I can access all of my files across my devices. 18. Mailchimp – Mailchimp is my email service provider of choice. The reason I like Mailchimp is that they offer a free plan if you stay under 2,000 subscribers and they integrate with just about every other service online. 19. Feedly – When Google closed Google Reader – I cried. I tried and experimented with many different RSS readers but finally found Feedly. Life is now better and dare I say it – I like Feedly better than Google Reader. 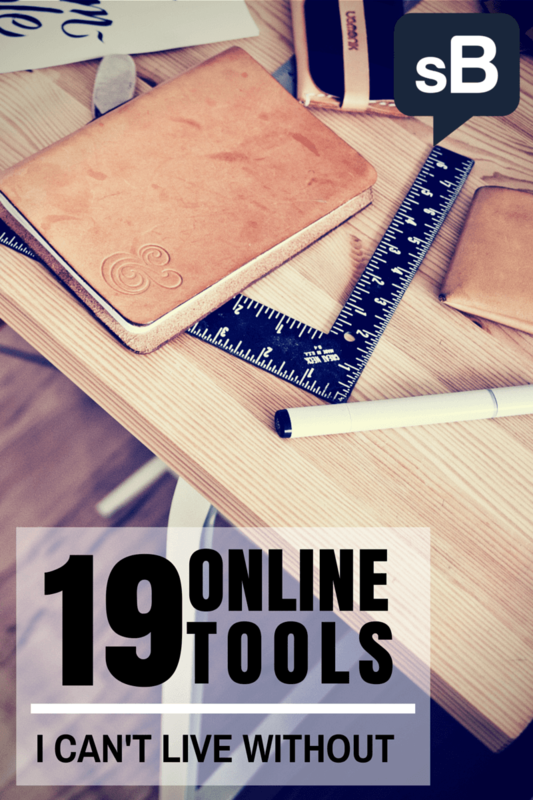 That was my list of 19 online tools I can’t live without. I’m always on the lookout for new and different tools though, so if you use and love a tool that I haven’t mentioned please share it in the comments section below. I like that list. Like Helen, I’m using some and some are new to me. Thanks for solid information. You’re welcome and thank you for taking the time to comment. I am not aware of Search Everything but will check it out – thanks for the recommendation! Thank you for this list Brendan. A few if these I already use, but there’s a lot of new stuff for me to check out here. If I may add a little utility that saves me lots of time: Search Everything (for Windows). It indexes the files on your computer and when you need any file, just start typing any part of its name that you remember and voila, there it is: almost instantly. I’ve been using it for years and couldn’t live without it anymore.